Let’s take a look at Canvas and the company that makes it, Instructure. Canvas has enjoyed tremendous growth in a shot amount of time. Most of this is due to the fact that many institutions are viewing it as an alternative to the closed LMS’s of the past decade (Blackboard, D2L). So what is Canvas ? What makes Canvas great for Maryville ? Canvas is extremely simple to use. The interface is easy to navigate and it looks modern. Canvas does updates in a different way – there are no outages for updates, no downtime for upgrades. The version of Canvas we have is the same version EVERY OTHER campus is using. No longer will there be service updates every 4th Sunday of the month. No longer will we have to schedule Service Packs to fix bugs. Canvas installs updates every 3 weeks ! This means a quicker turnaround for new/improved features AND bug fixes. Finally, there will never again be BIG upgrades. Big upgrades in the past meant spending time learning all of the new system. Now, Canvas will roll out new features every 3 weeks. You will learn new features will using the system the SAME way you learn new features of any website as they add them. Users can get notifications from the system ANY way they want. If they want the system to send them messages at Twitter, that’s an option. If they want to receive traditional email/text message notifications, that’s an option. Canvas had some great tools in addition to the regular expected ones (modules, quizzes, grades, discussions, announcements….etc). Canvas has a tool that allows for virtual meetings. Their is a tool for students to collaborate on documents (think Google Docs). There is a Wiki tool. Students can submit assignments via Google Drive. Canvas has two mobile apps.The Canvas App and the SppedGrader app. Both are FREE. Canvas App: Allows users to access ALL of their courses. View content items. Read and participate in discussions. Send messages to other users. View grades. Submit assignments. Add/edit files. 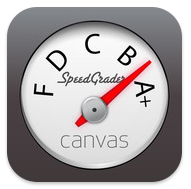 SpeedGrader: Allows faculty to grade assignments on the go. These are a few reasons, among many, why Canvas will be a great LMS for Maryville. What other cool things can Canvas do ? Keep checking back into this blog in the coming months for additional “sneek” peaks at Canvas. For now, you can listen to this webinar, recorded in November 2013, on getting ready to use Canvas.